For over eleven years we have been showing visitors the amazing variety of marine life at the number one dive site on the island, the El Cabrón Marine Reserve. 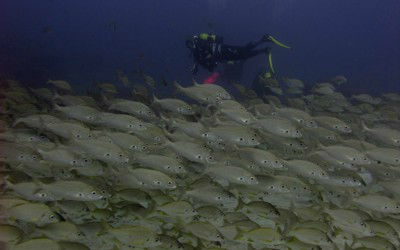 We take you the short ride to this wonderful dive site from our dive centre nearby in the old fishing town of Arinaga. The volcanic topography of the area has created some dramatic underwater scenery and you can swim through natural rock arches, and explore the caves and cliffs. 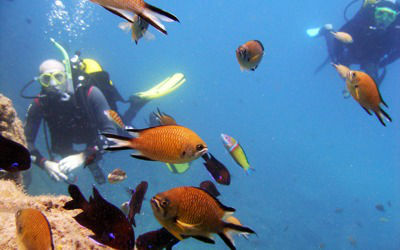 You can see almost the complete spectrum of Canarian underwater life, from small colourful creatures such as nudibrachs, damselfish, cleaner shrimps and seahorses, through amazing creatures such as cuttlefish, stargazer and trumpetfish, to top end species such as barracudas, angel sharks, rays and even the occasional turtle. You normally get to explore the area with most marine life at around 20m, and because of the ‘multi-level’ topography you get dive times of around 40-45 minutes. If you are more experienced, we can also explore the area of Punta de la Sal where you can descend to 30m deep. We always ensure that every day the diving is varied, and when we have very experienced divers we plan and dive some of the more challenging routes. Over the last ten years we have been inspected and recognised by a variety of different organisations for our commitment to safe and enjoyable excursions and diver education. We were awarded PADI 5 star status in 2004, and are also a BSAC Premier Dive Centre, A Canary Islands Water Sports Centre and are approved by the Canarian Government to offer both dive excursions and training. We have also just been awarded a ‘TripAdvisor Certificate of excellence for 2014′. 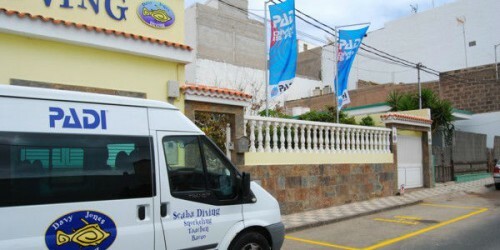 We are the only PADI dive centre within a 40km radius and the oldest professional dive centre in Arinaga. In December 2013 we moved into our new dive centre, Casa Limon. This is completely different to the centre that had been our home for eleven years where we had no outside space. Casa Limon is situated in a small tropical garden, and we have a range or sitting/relaxing areas both in the shade and sun as well as all of the usual amenities that you would expect from a dive centre. So far the reaction of our new divers and many of our regular customers have been very positive and all love the peace and tranquillity that this brings to the diving day, whilst preparing for the dive and during the dive interval. In fact many are reluctant to return and love to linger rather longer than they used to if the opportunity presents itself. With our centre right next to the dive sites of the El Cabrón you are able to use our facilities before, between and after diving. This means that not only can you set up your equipment and get ready in the dive centre, but when you return during the dive interval you can have a hot drink, change your tanks and use our other facilities including free wi-fi. 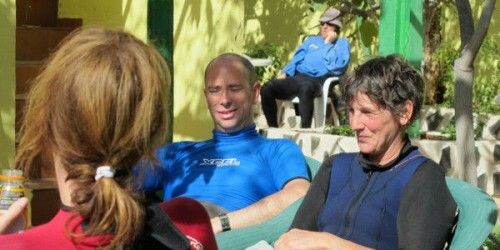 This is a great advantage, and is much more relaxed and comfortable than coming to dive in El Cabrón with other dive operators, who have to sit and wait on the rock by the dive site, as there are no onshore facilities within the Reserve. We complete most of our dives within the Reserve as this is where most of the visitors to the island want to dive, and we also organise, subject to demand, explorations of other dive sites on the island. Sardina del Norte is renowned for Angel Sharks and Manta Rays at certain times of the year, and around Puerto Rico and Mogan there are boat dives available, the best of which are the reefs at Pasito Blanco and the twin wrecks near Mogan. These wrecks are suitable for less experienced divers and were sunk primarily for the customers on the “Yellow Submarine”, which departs from Mogan, but they are also regularly dived as well. If we have a group, then the wrecks of Las Palmas are suitable for more experienced divers, who are qualified to and regularly dive to 30 metres. To dive the wrecks of Las Palmas you must hold an Advanced Open Water qualification certifying you to dive to 30 metres, and also show that you have regularly done so. The dive conditions from Las Palmas can sometimes be more taxing and you also need to show you have good air consumption and buoyancy. 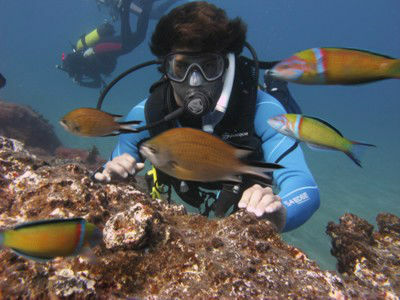 However the most variety, and number of routes and highlights are to be found here at Arinaga within the El Cabrón Marine Reserve.